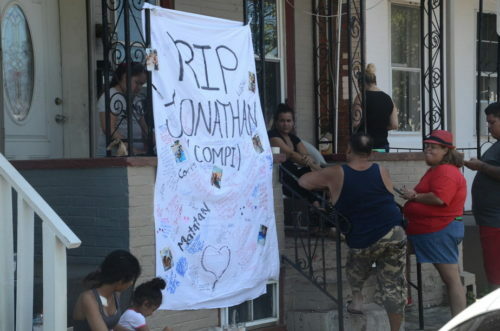 Community mourns death of Trenton man killed Friday | Homicide Watch Trenton | Mark every death. Remember every victim. Follow every case. A woman who was walking across Emory Avenue Sunday afternoon noticed a makeshift memorial in honor of Jonathan Jimenez and made the sign of the cross on her body. The woman doesn’t know Jimenez, nor any of his family, but it was a gesture of understanding and faith that justice will prevail. Jimenez, 32, was shot and killed in the Chambersburg section of the city outside of his Cummings Avenue home Friday night. His relatives say he moved into the property three days prior to his death. Jimenez left behind three children: a 10-year-old son and two daughters, ages 15 and 11. He also has two brothers living in Trenton, one of whom is his twin. His relatives say Jonathan most recently worked for a car dealership, where he cleaned and detailed cars, which was one of his favorite pastimes. He often found landscaping work as well, and he used to be employed as a security guard at Ilusiones Bar and Restaurant on Roebling Avenue. His family says Jonathan moved from Puerto Rico to the United States more than a decade ago to pursue “a better life.” His older brother Humberto, whom has lived here for 22 years, described Puerto Rico as a violent place where men are often shot simply for looking at another man’s girlfriend. Humberto said the U.S. was a better fit for Jonathan because he was outgoing and friendly to everyone. He never expected his brother to be gunned down in cold blood, Humberto said. It’s no secret that the Chambersburg section of Trenton has become a hotbed of crime in recent years. Last week, officials told The Trentonian that police are creating a plan to address crime throughout the neighborhood. Gloria Ruiz, who’s the godmother of Jonathan’s oldest daughter, said residents of Chambersburg no longer look out for one another, which is most likely attributed to the lack of homeownership throughout the community. As of press time Sunday, police have not disclosed a motive for the killing, nor have they charged anyone in connection with Jonathan’s death. But witnesses of the shooting reported seeing two Hispanic males flee the crime scene in a vehicle that was later found a few blocks away. Police say the vehicle has been processed for fingerprints, DNA and anything else of evidentiary value. Jonathan’s family plans to send his body back to Puerto Rico to be laid to rest on a plot of land where other family members are buried, Humberto said. 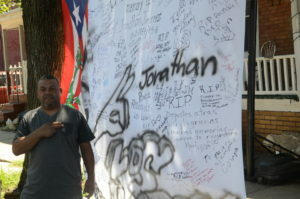 As friends visited the two memorials honoring Jonathan’s life Sunday, the family tried their best to honor wishes he expressed to them years ago. So far this year, 13 people have been murdered in the capital city. 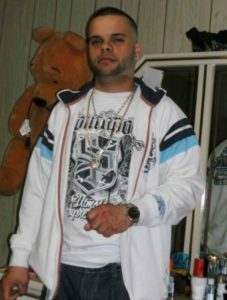 Anyone with information about Jimenez’s death is asked to contact the Mercer County Homicide Task Force at 609-989-6406. Or call the Trenton Police confidential tip line at 609-989-3663. Individuals may also call the Trenton Crime Stoppers tip line at 609-278-8477. Those wishing to text a tip can send a message labeled TCSTIPS to Trenton Crime Stoppers at 274637.